Pleiotropy: The beliefs of others... they matter! 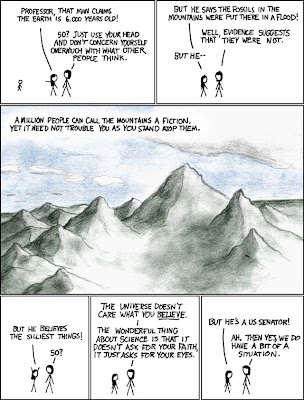 Margaret Morgan just alerted me to this old xkcd comic. Old, but unfortunately more pertinent than ever. So many people have told me that it is a fools errand to care what other people believe. Or that it's just none of my business. Or that I am arrogant to even have an opinion about the beliefs of others. Well, as this comic illustrates, the beliefs of others sometimes matters in very tangible ways. Besides, religious people impose their beliefs on others all the time, as when they go door to door telling us that we are going to hell*, or when they pass laws based on ancient texts written by homophobic bigots. * Actually, as I learned the most annoying way, Jehova's Witnesses don't believe there is a hell at all. Boring! Her daughter sure looked like she lived there.